James Bendle waved goodbye to his wife and sons and set sail for the Southern Ocean. 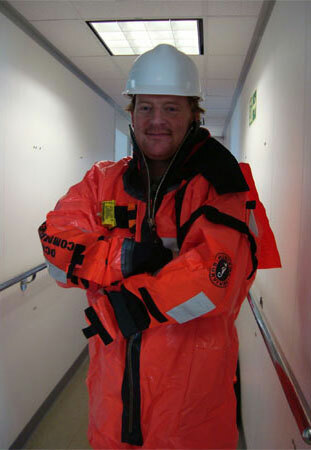 I was on a research cruise in the North Atlantic once, in a storm that got up to Force 10. We do have to cross the Roaring Forties and through the zone of the Southern Ocean where you get continuous storms. James and the other scientists on the JOIDES Resolution will be working 12-hour shifts without a day off for almost three months. Hard work, long hours and some danger - so why do it? I'm getting the chance to go to Antarctica and do interesting and exciting science. James and his colleagues are exploring the past to learn about the future. The near future when the Earth has warmed a little more and the Antarctic ice starts seriously melting. We know the atmosphere is going to warm further because of increasing levels of greenhouse gases. That's what we're going back in time, through these different layers of sediment, to look at. Thirty-five million years ago Antarctica was a very different place to the snow-white, desolate, lifeless land we're familiar with today. Very soon we may reach the threshold that was passed 35 million years ago - and pass it in the other direction." The ice on the massive continent will melt and sea levels around the Earth will rise by several metres. If the scientists can get enough detail about the 35-million-year-old past they can tell us about the future. We palaeo-climatologists use natural archives that have recorded past climate change. The four classic archives are ocean and lake sediments, ice cores, corals and tree rings. Scientists go out to sea to drill that layer cake and bring material from deep inside it back to their labs. We collect the sediments and do initial analysis on board. Then they'll be packaged up and shipped to the scientists' labs, where we'll be working on them for years. We hope to present data within a year at scientific conferences, and to be publishing our first papers within two years. It's sure to produce memories that will stay with me forever. A fortnight after the birth of his second child, palaeo-climatologist James Bendle waved goodbye to his wife and sons and set sail for the Southern Ocean. "George is four and has seen me go away on expeditions and come back again," he told us just before he left. "He's been through it several times and is used to it now. He asks me about the research ship and I show him videos of it. He'll miss me, of course, but he is interested. The baby is so young that he won't miss me. But it is going to be hard for my wife." It won't be a cakewalk for Dr Bendle himself. 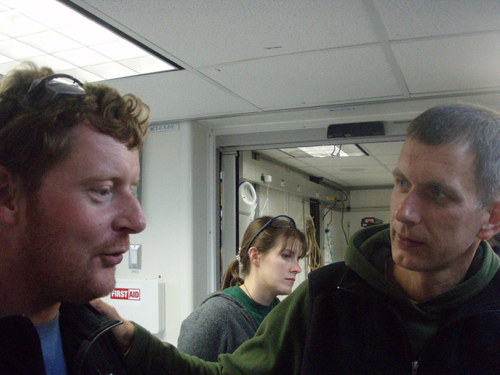 Apart from missing his wife and family, conditions can get testing for scientists on a research ship drilling for sediment cores in the ocean. "I was on a research cruise in the North Atlantic once, in a storm that got up to Force 10," he says. "Force 11 at some points which is almost hurricane strength." When that happens all lab work on the ship stops, and the crew and scientists bolt everything down and try to ride out the storm. "You want to start worrying, I was told, when you see all the officers wearing lifejackets," James says. "It has happened on research ships that got caught in really bad storms. But we weren't at that point. "We do have to cross the Roaring Forties and through the zone of the Southern Ocean where you get continuous storms, to get to the drilling sites. Storms at sea are part of the danger though and part of the challenge. We are on a big ship with an experienced crew. So it's not something I'll be worrying about." Even when conditions are fairly calm, James and the other scientists on the JOIDES Resolution will be working 12-hour shifts without a day off for almost three months. Hard work, long hours and some danger - so why do it? "How many people get the chance to work in Antarctica?" he replies. "I've already been to the Arctic and other beautiful places, and now I'm getting the chance to go to Antarctica and do interesting and exciting science." It's also important science - and not just to other scientists. James and his colleagues are exploring the past to learn about the future - the near future when the Earth has warmed a little more and the Antarctic ice starts seriously melting. "We know the atmosphere is going to warm further because of increasing levels of greenhouse gases," James says. "One question science still needs to answer is this - how much will sea levels rise in response to those increases in temperature? "We really don't know how sensitive the ice on Antarctica is to changes in temperature. It might respond relatively slowly to the planet warming. But there is no guarantee of that. That's what we're going back in time, through these different layers of sediment, to look at. "When the temperature was a few degrees higher than it is now, how much ice was on Antarctica? How much higher was the sea level?" Thirty-five million years ago Antarctica was a very different place to the snow-white, desolate, lifeless land we're familiar with today. There were forests then, teeming with plants, insects and animals - the mammal and reptile ancestors of today's life on Earth. Then a threshold was reached. The climate quickly cooled. There was a build-up of ice and snow on the southern continent. A green land became white and barren. The Earth is headed for that tipping-point again, James says. With one big difference. "Very soon we may reach the threshold that was passed 35 million years ago - and pass it in the other direction." If that happens the ice on the massive continent will melt, Antarctica will become green again, and sea levels around the Earth will rise by several metres. "So the question is this: what was the temperature of the water around Antarctica at the point when it glaciated 35 million years ago?" James says. "What were the carbon dioxide levels in the atmosphere?" If the scientists can get enough detail about the 35-million-year-old past they can tell us about the future. But they need temperatures, carbon dioxide levels, ocean salinity, solar radiation. How can they get all that? There were no thermometers on Earth 35 million years ago. There were no humans. The secret is natural archives, James explains. "An archive is something that stores information. So your local library is an archive. The hard disk on your computer is an archive. We palaeo-climatologists use natural archives that have recorded past climate change. The four classic archives are ocean and lake sediments, ice cores, corals and tree rings." What these natural archives have in common is that like printed words on paper or magnetized regions on thin film they contain records that can be read. But records of what exactly? "Take sediments, which is my area of speciality," James says. "You have creatures living in the sunlit upper ocean, which die then fall down through the water. So you get a slow accumulation of sediment on the ocean floor, building up like a layer cake." Scientists like James, on ships like the JOIDES Resolution, go out to sea to drill that layer cake and bring material from deep inside it back to their labs. But instead of slices, they cut out long cylinders from top to bottom. Then what? Well figuring out what is in the layers of sediment - and what it tells us - can keep the scientists busy for years, James says. 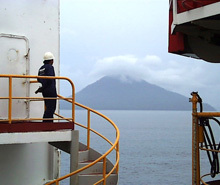 "We collect the sediments and do initial analysis on board. But all the material goes back with the ship to the International Ocean Drilling Programme repository at College Station, Texas. Some time after the scientists get back from the expedition they all go to Texas for a week and we have the 'sampling party'. 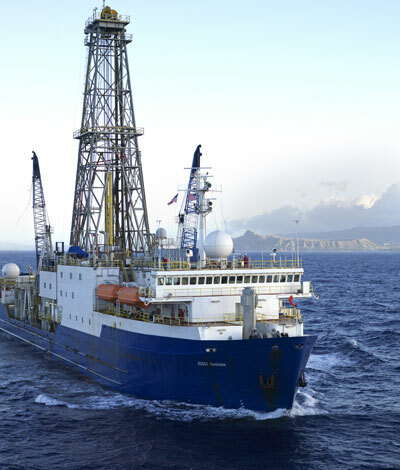 "It's not really a party but an intense period of work, where we open up all the sediment cores and take samples. These are then freeze-dried to eliminate water. That helps preserve them and stops bacterial decay or contamination. Then they'll be packaged up and shipped to the scientists' labs, where we'll be working on them for years." So will it be worth it - the storms, the 12-hour shifts, the months away from wife, son and new-born baby? "We hope to present data within a year at scientific conferences, and to be publishing our first papers within two years," James replies. "We will probably have enough material to supply several PhD projects and we may well be publishing papers for a decade afterwards. "It is going to be hard work. I will miss my family. But it beats being in the office or the lab every day. And it's sure to produce memories that will stay with me forever."